Here's a great way to wrap up the year and give it away in a cute bread wreath. Stollen is a German Holiday bread that has dried fruits and sometimes marzipan inside. After making a couple of these breads for gifts, I have decided this bread would make a great Spring time, and "Anytime" bread, too. I took my Stollen with me to a family vacation and we made toast, French toast, and ultimately a fantastic Fruited Bread Pudding within the week. I hope you'll take the time to try this Stollen. The recipe is simple and the results look professional. I know your friends and family will be stunned by your Stollen. The 2010 December Daring Bakers’ challenge was hosted by Penny of Sweet Sadie’s Baking. She chose to challenge Daring Bakers’ to make Stollen. She adapted a friend’s family recipe and combined it with information from friends, techniques from Peter Reinhart’s book.........and Martha Stewart’s demonstration. 1) In a small bowl, add: 1/4 cup of very warm water and sprinkle the yeast over the water. Let sit for about 5 minutes to get foamy. 2) In your large mixing bowl, add: Flour, sugar, salt, cinnamon, lemon and orange zest and mix together, using the paddle attachment. 4) In a saucepan, heat: the milk and butter together until the butter is melted, remove from heat. 5) In another small bowl, add: the raisins and 3 Tbls. of rum to soak for a few minutes. 1) In the mixing bowl with the flour, etc.., use the paddle attachment and add in the yeast mixture, the eggs and the lukewarm milk & butter. Mix together on low until well combined and a soft, but not sticky dough forms. Once the dough comes together, stop and cover with a tea towel or plastic and allow to rest for 10 minutes. The dough smells like warmed dark spices, even at this point. 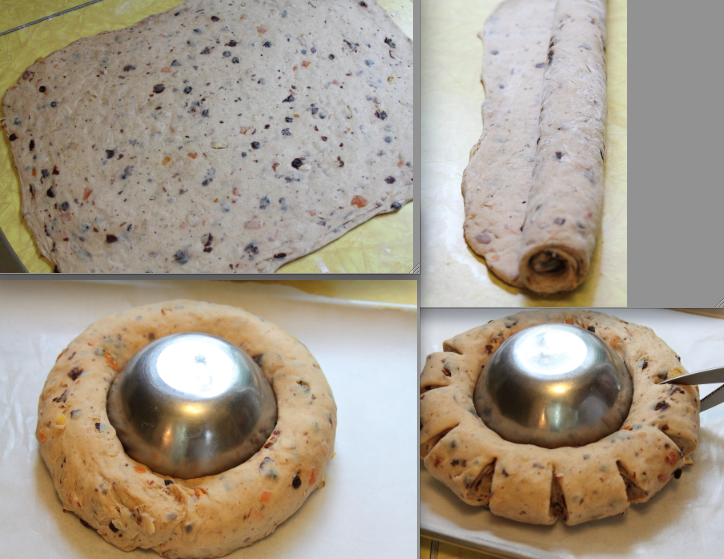 2) Using the dough hook, add in the mixed peel, soaked raisins, and almonds and mix on low speed. 3) Now, you can continue to knead with the dough hook for at least 6 minutes, or you can sprinkle flour on the counter and transfer the dough there and knead for about 8-10 minutes. The kneading is very important to distribute the dried fruit and to build up the bread-dough consistency. You can tell when the dough is done well it is tacky and the raisins that used to stay in the dough when it was sticky will sometimes drop off. 4) Lightly oil a large bowl and transfer the dough to the bowl, rolling around to coat it with the oil. Cover the bowl with plastic wrap and put in the fridge overnight. The dough will become very firm as the butter gets chilled, but it does rise slowly. The raw dough can be kept in the fridge up to a week and then baked on the day you want. (That is such a plus during this busy time of year!) Remember you'll need a couple hours for the dough to sit out of the fridge before shaping and baking on that day. Wow, looks gorgeous, and I love that you made your own candied peel. Best wishes for a happy new year. What an absolutely beautiful bread. I've never made one after seeing yours, I definitely want to give one a try!! Wishing you and your family a happy, healthy and joyous 2011! !